Does your 1st grader know her seasons well? Can she tell what heralds the beginning of spring and what are the distinctive characteristics of the season? 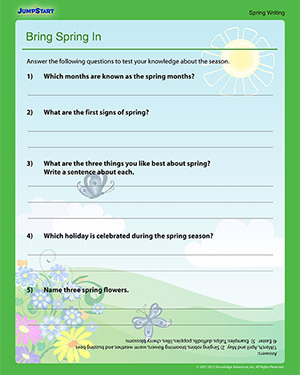 Find out with ‘Bring Spring In’, a fun spring worksheet that will teach the little ones all they need to know about the season. With its pretty spring colors and the perfect spring feel, this worksheet is sure to be a big hit with the little ones!